Integrity is an essential component to true and practical Christianity. It represents perfect, harmonious and holistic unity, as pictured in the Trinity. Incarnation is another beautiful illustration of integrity, God becoming flesh and the Word becoming deeds. BAM should be founded and operated under this integrity. The following article depicts integrity and its implication to BAM well. Min-Young Jung was a missionary to Indonesia where he helped translate the bible for a minority people. He was Deputy CEO for GBT (Global Bible Translators) and until recently Vice President at Wycliffe International. 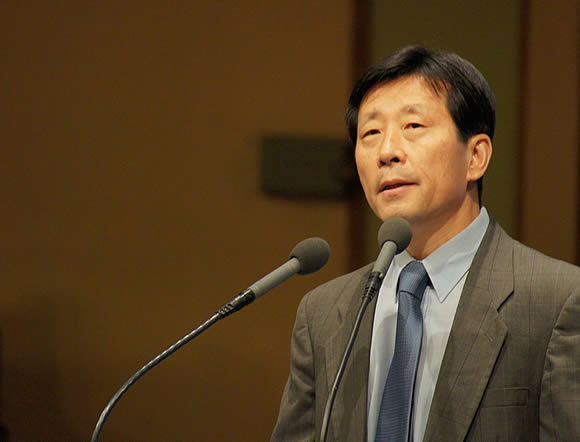 Min-Young is Adviser to SfK Ministries on Global Missions Strategy. In economy, the marketplace is where all the action is. Yet, from a religious perspective, it is often frowned upon and for some, even despised. God is not averse to the marketplace. In fact, He restores the marketplace to where it belongs. Mats Tunehag eloquently describes God within the marketplace. To read Mr. Tunehags article, click HERE. A group of senior leadership members of SfK Ministries had a gathering in Chiang Mai in February to discuss business plans for 2017 and beyond. Lausanne Movement and BAM Global Think Tank jointly hosted the 'Wealth Creation for Holistic Transformation' Consultation in Chiang Mai, Thailand, from March 7 - 11. Jeffrey participated in two sub-groups and also served on a panel. Skybay Thailand, the Thailand implementing member of SfK Ministries, has launched an informal gathering for business people who are interested in BAM. They will meet on a monthly basis and share their experiences for peer learning. SfK Ministries will soon launch its Korean webpage. Also, the English webpage will be refined with more contents. Please check it out at www.sfkministries.org in a few days. From the April issue, SfK Newsletter will carry a new column, called "The Missional Entrepreneur." This column will be written by Mark Russell, a member of SfK Life board and the author of the book, titled "The Missional Entrepreneur." Mark will share helpful insights for missional entrepreneurs to learn and practice. Stay tuned. March 16, 2017: SfK Korea, the Korean counterpart of SfK Ministries, will hold a Thanksgiving and Dedication Service in Seoul, Korea. After the service, SfK Korea will also introduce SfK BAM Fund I, a missional impact fund, the first of its kind in Korea. Please pray that the service will honor God and edify Christian leaders. March 23, 2017: Skybay Thailand, the Thailand implementing member of SfK Ministries, will celebrate its second anniversary in Bangkok, Thailand. Classical musicians, as well as a Christian Hip-Hop group will perform during the celebration. Many non-Christians will also be invited. March 27-28, 2017: SfK Ministries will hold a 2-day BAM seminar in Bangkok, Thailand. Approximately 10 BAMers will attend this seminar to learn and practice BAM principles. Please pray that this seminar will bear fruits of understanding and determination. April 3-7, 2017: SfK Ministries will hold a 5-day SfK Mini MBA (Missional Business Academy) in Kigali, Rwanda. Please pray that God will prepare the hearts of participants to gain understanding and see the light. 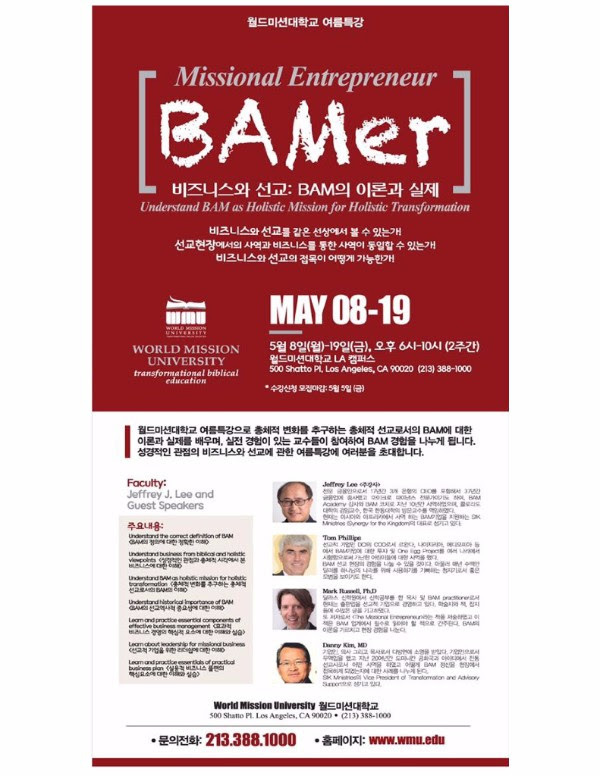 May 8-19, 2017: SfK Ministries will present a 2-week intensive BAM Training Course, titled BAM Principles and Practices, at World Mission University, Los Angeles, CA. The class is open to the general public as well as to students for a grade. The following poster shows the faculty and core contents of the Course. Please pray that God will call and challenge business leaders for this noble task. Until we share with you what God is doing through SfK Ministries, may His peace be with you.